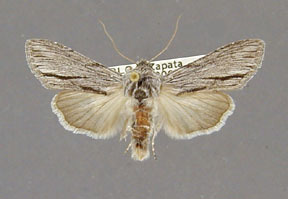 Cleophana eulepis Grote, 1875, Bull. Buffalo Soc. Nat. Hist., 3:86. 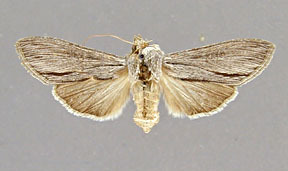 Cucullia bistriga Smith, 1892, Proc. U. S. Natl. Mus., 15:47. Copicucullia mala Smith, 1908, Ann. New York Acad. Sci., 18:118. Diagnosis: Cucullia eulepis is midway in size and appearance between astigma and cucullioides. Forewing length from base to apex is approximately 16.5 mm compared with an average length of 19.5 mm in astigma and 13.5 mm in cuculloides. 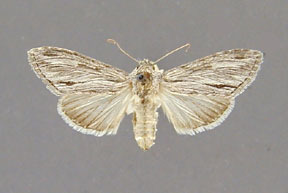 The forewing is smooth, light gray to gray without the striate effect found in cucullioides. The middle of the forewing is usually noticeably darker than the rest of the wing in eulepis, but the forewing is uniformly gray in astigma. 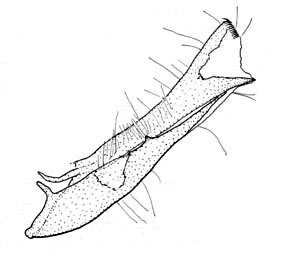 The foretibia of eulepis bears a visible claw; the claw is absent in cucullioides. The first sternite of the male abdomen lacks hair pencils, but hair pencils are present in cucullioides. 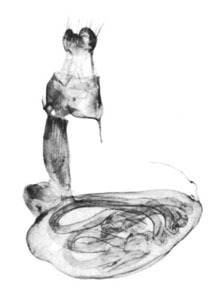 The male genitalia are more similar to those of cucullioides than to astigma. In particular the clasper is greatly reduced and the apex of the valve is produced into a ventral projection. The female ovipositer lobes are narrow and divided into a lower portion with a few spines and an upper portion bearing several strong spines. This condition is apparently intermediate between the "normal" ovipositer lobes of the genus and the extreme modification found in cucullioides. Cucullia eulepis and cucullioides might not belong to this group. Although both species have a two-spined vesica, a strong dentate band exists at the base of the most basal spine-bearing diverticulum, an atypical condition for most of the species in the group. Secondly, an obvious digitus exists in both species. A digitus is absent in the majority of species in Cucullia but is found in these two species and some species from the Palaeartic, e.g. Cucullia tanaceti [Denis and Schiffermüller]. Third, the membrane between the seventh and eighth sternites of the female abdomen is not leathery and tough as in most other North American species of the genus. The seventh sternite is unmodified and lacks a distal ledge of specialized patches of scales in the lateral membranes. The eighth sternite is strongly sclerotized in both species. Two characters support the inclusion of eulepis and cucullioides in the antipoda group. 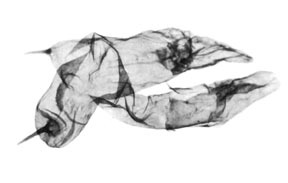 The corpus bursae in both species is strongly perpendicular to the ductus bursae, even more so than in antipoda, and the apophyses anteriores are very short, a character shared with antipoda and its relatives. For the moment eulepis and cucullioides appear best placed in this group. Wing length from base to apex: mean = 16.49 mm., standard deviation = 0.80 mm., n = 10. Distribution: The distribution of this species is spotty. The species occurs on the eastern, dry edge of the Cascades in Washington and Oregon. In California it has been collected throughout the state but perhaps more commonly in southern California, although this may be an artifact of collecting intensity. Its eastern limit is on the eastern slope of the Rockies in Colorado. The species is also known from most of Nevada, and Mohave and Maricopa Counties in Arizona. Little geographical variability is apparent in this species. A small amount of within population variability is present in the distinctness of the markings and the degree of contrast between the costa and middle of the forewing. None of this variability is particularly significant. Females, on the whole, are slightly darker than males, particularly the hindwing. Adults have been collected from March to October. There may be two abundance peaks in southern California; one in late spring, and another in autumn. 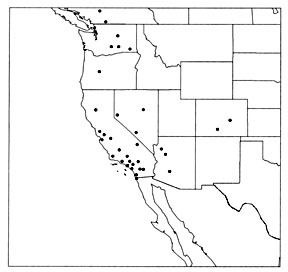 Foodplants: A specimen in the LACM from Los Angeles County, California was reared from Stephanomeria exigua, an annual composite.